Kim Annabelle Werlen has been with SWISS for almost ten years now, and today is taking you to the world of the Arabian Nights – specifically to Muscat, the capital of the Sultanate of Oman. As Kim spends only a part of her working time above the clouds, she is always pleased to have the opportunity to fly. However, the historical city of Muscat with its flourishing oriental life appeals to her almost more than any other. "Oman is a wonderful country, and I am simply fascinated by the Arabian tradition," Kim enthuses. She is spending a day with us in this jewel on the Gulf of Oman. The white shimmering settlements of Muscat are located in a small bay, surrounded by stark mountains and the radiant blue of the sea with countless beaches. The city's mosques and palaces bear witness to its thousands of years of history. The Persians, Arabs and Portuguese have all left their mark. The city's architecture reflects this influence most clearly: ornate decorations on houses, surprisingly colourful streets and a small harbour embellish the cityscape. The best time to visit Muscat is between November and April. 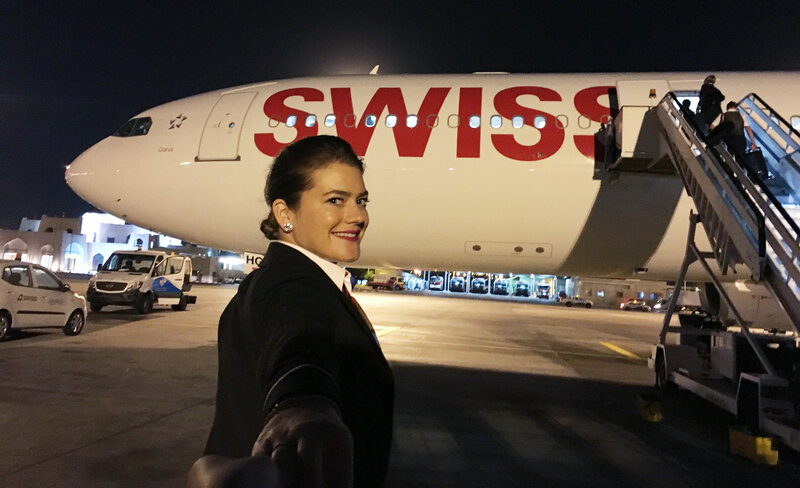 SWISS flies daily to Muscat (MCT) from Zurich (ZRH). The Habboh Café is a great place to start the day. "It serves a delicious home-cooked breakfast," says Kim. "And the name is perfect, because 'habboh' is the Arabic word for 'grandmother'." Explore the city! The Sultan Quabus-Mosque, also called the "Grand Mosque", is open to anyone of either gender as long as they are dressed appropriately. The mosque, which was opened in 2001, is one of the biggest and most impressive mosques in the area. "The Sultan Qaboos Mosque simply has to be seen. The highlights are undoubtedly the finest wood panelling, the prayer carpet, which weighs 21 tonnes, and the vast crystal chandelier," says Kim. The mosque is open to visitors from Saturday to Thursday morning. After this cultural experience, it's nice to get out into the country, to the oases of Wadi Shab. The best way to get to the oases, which are about 150 km from Muscat, is to hire a car. Kim loves the green Wadis. "The countryside is fascinating – the natural pools are surrounded by palm trees and wild fig trees. After a walk through the sandy landscape, this is the perfect spot to cool down!" After the visit to the oases you're sure to be feeling hungry! Kim loves the Copper Restaurant. Its urban ambience is perfect for enjoying a tasty burger and fries. "A great contrast to the oriental breakfast and the mezzes in the evening," Kim finds. We all know it's not a good idea to swim just after eating, but you can safely cool your feet on the city beach at Qurum. "This extensive beach is lovely! I could spend hours walking here, and enjoying the views of the sea from any of the numerous cafés," says Kim. After an approximately hour-long walk along the promenade, Kim treats herself to a breather at the Kargeen open-air café. "I fell for its very special charm!" Enjoy authentic Arabian specialities mezze-style such as "kabsa" or "shuwa" by the light of the colourful oil lamps. It also serves wonderful, freshly roasted coffee with a delicious date cake. After the relaxed afternoon, it's now time to demonstrate some bargaining skills. At the lively Mutrah Souq, the smells of spices and incense fill the air, and there are all kinds of lovely little things to buy, including Omani artworks, traditional fabrics and textiles, spices, jewellery and much more. "You really shouldn't miss the market – it's such an experience!" says Kim. "And another special highlight is the fruit and fish market, which is close by." There are various options for after shopping: either you can enjoy the sunset over the harbour or visit Kim's last insider tip, the charmingly designed restaurant The Cave. "There are fabulous views over the suburb Ruwi from the terrace," enthuses Kim. "And the food is amazing!"